About 65 per cent of Canadian households own at least one pet, stated Emma Harris, founder of Healthy Pets . The opportunity for product placement and tie-ins to this magazine could be plentiful, receiving lead sponsorship from Purina. 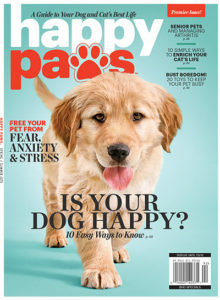 And while the internet is obviously awash in animal-related adorableness, Happy Paws’ content is meant to be authoritatively servicey; the first issue’s line-up will include articles on “helping your pet overcome fears and anxieties” and “training methods that build communication and trust.” 1. This magazine will also encourage things like stimulating the pet’s mind and baking homemade pet treats, so you can imagine there will be product placement and the possibility for cross-merchandise displays for the holidays! With that in mind, marketers can also expect to get some positive results, with MediaPost reporting that often print can drive online performance given the right content. Kantar TNS also reports that people read pieces that come into their homes 3.8 times, and 21% of them go on to create a commercial action from those pieces – whether it be visiting a website or visiting a store directly. Whatever the result, I know as a dog owner that I will be checking it out with my pup – there’s never too many dog related stories, articles, or advertisements for us!